Halloween may be one day, but since Champaign-Urbana (ourselves included) is positively spellbound over this haunted holiday, we are ready to let the cackling, carving, and candy craziness begin! We’ve got the lowdown on all the family-friendly Halloween/fall events in and around the Champaign-Urbana area. Back to our guide! Most of these events you can attend on the fly, but a few do require pre-registration, as noted below. Events are listed chronologically by start date. We will keep adding events as they are announced, so check back often; all events are also listed on our events calendar. Click on the links for more information including times and locations; admission fees (if any); and other details. Have we missed any events? Let us know – submit your event HERE or email us, and check back often to see what we’ve added. For Daily Fall Fun – check out our list of Champaign-Urbana area pumpkin patches, apple orchards and corn mazes. Also, check out our list of Fall Festivals. 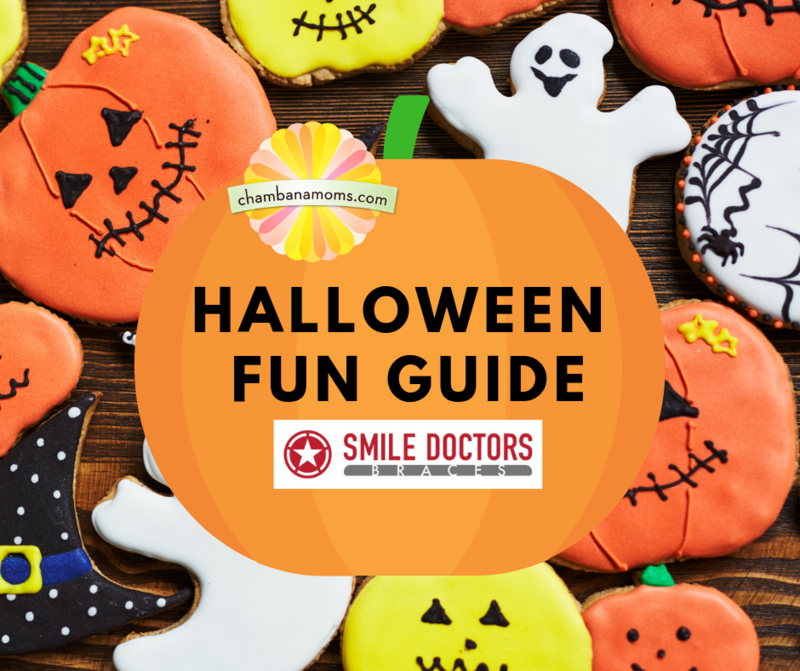 Check out our FRIGHT GUIDE for scarier activities for an older crowd. We list Kids Eat Free on Halloween: Deals Around Champaign-Urbana and Beyond here. Looking for Trunk or Treat events, see our post here. Looking for area Trick or Treat Times? You can find that here. Ready for the big night? See our Champaign-Urbana Halloween Weather Forecast. Already worried that you might have way too much candy? See our Top 7 Things To Do with Leftover Halloween Candy. Strange things happen in the Dallas & Company Haunted Room. Those who dare to enter are greeted with a talking ghost, witches, zombies, skeletons and what APPEARS to be lifeless bodies. The whole family (even dogs) will enjoy an old-fashioned night at the drive-in with two family-friendly movies. A film special effects makeup artist gives a demonstration/tutorial on how to turn yourself into a vampire. For all ages. Spooky stories and autumn activities await you! Enjoy the fun traditions of the season, including pumpkin carving and decorating, scarecrow making, hay-rack rides, open fire cooking, and spooky stories! Pre-register for a pumpkin. Catch this classic movie at the Virginia Theatre; tickets are $5 each. Less than bewitched by last year’s Halloween outfits? Donate your old threads and give kids a night of happy haunting! Donation of items not required to pick up a new costume. FREE. Bring the kids to Rural King for some Halloween fun. They can sit down with our team and decorate pumpkins to take home! Please join us in a celebration of children, treats and our local businesses. Dress in costume and trick-or-treat among participating storefronts throughout Mahomet. Get ready for Halloween with a costume contest for your pet! Prizes will be awarded to the pet wearing the best literary costume, the spookiest costume, and the best pet and owner costume combo! Register your pet ahead of time. Bring the kids to enjoy free treats, games, and other fun activities with Coldwell Banker The Real Estate Group agents and staff. Saturday, October 20, 2018 at 8 PM – 11 PM Come climb the TOWER OF TERROR up on the abandoned 3rd floor of the old Homer school. You may go up, but you might not come down. Cost is 5 dollars. Cash or check accepted. Ages 10 and Up recommended. A student fundraiser for Heritage High School Publications. For more information, click here. Hocus Pocus at The Virginia Theatre! Come out before the 2pm showing to ride the Haunted Hayrack Ride, visit the Bug Petting Zoo, and wear a costume, too! This FREE event will also have non-candy items offered for those with food allergies and inviting areas for children that may have sensory concerns. Costume contest and best-decorated trunk content, too! A FREE family-friendly trick or treating event with interactive stations, special guests, Illini athletes, favorite characters, and of course, candy! Bring the family to Illini Volleyball for a night of Halloween themed festivities! FREE candy for the first 200 kids and FREE general admission to anyone dressed in a costume! Dress up in your favorite costume and join us for trick-or-treating, games, and a costume contest. Take a walk through our spooktacularly (family-friendly) Haunted House, and don’t forget to bring a bag to collect all your goodies. This is a FREE family event! Halloween House of HORRORible Fun! Siebel Center for Design is bringing a FREE HALLOWEEN PARTY! There will be food, costume making, laser etching on pumpkins and more! Catch Hotel Transylvania 3 for FREE if you belong to FMG Rewards; non-members pay $1 per ticket. Families can trick or treat at participating downtown Urbana businesses from and 1 pm to 5 pm. Make your own Halloween crafts, play old fashioned Halloween games, and learn about how Halloween traditions were shaped. Come and go anytime during the program to join in the fun. Costumes encouraged. Broadway Food Hall & friends will be hosting another FLAIR event just before Halloween - sure to be a FRIGHTENINGLY good time! It's prom season at the Library. This one will be just like a regular prom, but everything will be zombified! A photo ID is required for entrance (school ID is fine), or with special permission from the Teen Services librarians. Come join us in Downtown Mahomet for a great time of Trunk or Treat while area businesses set up downtown on Main St to pass out candy in there decorated cars. Bring your flashlights and join us for a hayrack ride in the Haunted Forest through the Salt Creek Area 21 Campsites in Farmer City, IL! The Annual Harvest Party is coming. Enjoy a wonderful time of fun and food. Event is all indoors. Make-a-monster workshop, a live concert with Urbana Pops Orchestra with your favorite ghostly songs, costume dress up, face painting, spooky story time and more! We're inviting kids and families to trick or treat at your local Green View Garden Center. Kids ages 0-12 are invited to dress up in their Halloween costumes to Trick or Treat in a safe environment! Join us at Crisis Nursery on Saturday, October 27th from 10am-11:30am for our Halloween Open House! Kids are encouraged to come in costume to join in on the trick-or-treating fun. We will have face-painting, snacks, & crafts. Dress up your pet or livestock and bring them in to win an RK gift card and some food for your lucky animal. See store for more details! You are invited to spooktacular festivities sure to please the entire family. Plan to come dressed in your favorite Halloween costume and Trunk or Treat in the safety of our parking lot. The Orpheum's annual Halloween Spooktacular! You are your family can become mad scientists in this chemistry-themed not-so-scary spooktacular event sponsored by the R.E.A.C.T Chemistry. Come in costume if you want for an outdoor Halloween Treasure Hunt. Other games and goodies will also be available on the Library's lawn. Registration opens October 10. Join us for a family-friendly hayrack ride in the Haunted Forest through the Salt Creek Area 21 Campsites in Farmer City, IL! This is the *matinee* version of the hayrack ride and involves a costume contest, too! Celebrate Halloween by joining us for a spooky story, creepy craft, ghoulish games and spook-tacular face painting by Wild Style. Costumes and kids of all ages are welcome. Stop by the church on Saturday, October 27th from 4pm-6pm for food, candy, and fun! Come dressed in your Halloween Costume if desired! We will have the Kona Ice Truck here (weather permitting), a bounce house for kids, and more! Join us at Douglass Park for our annual Halloween party! Enjoy activities, free candy giveaway, and more! This is a free event for all ages. This is an opportunity for kids in the community to trick or treat in a safe environment. Wear your costume to Skateland Savoy for its annual Halloween costume skate. Winners get a Skateland gift card! There will be a horse Halloween costume contest, pony rides, pumpkin painting, games, and a bake sale. You can even vote for your favorite horse costume! Come over to the University of Illinois campus to Trick or Treat with your children at Sherman Hall. All candy is provided by University Staff. Their students are volunteering their rooms as a location for your children to knock and get candy. Indian Acres is hosting its second annual Trunk or Treat! Skate in costume at the UI Ice Arena's Spooky Skate. Join us for the 5th Annual Mayfair Park Halloween Parade! Dress up and enjoy a perfectly spooktacular parade around the park for this small neighborhood parade! We’ll also have games, treats, and a frighteningly good time for ghosts and goblins of all ages. We will parade around the park at 3:00 pm followed by snacks and games in the park. Please bring a snack to share. Please note this is a small neighborhood parade. Come and have fun at our annual Fall Festival! This years event is on Sunday, October 28th at 3:00 - 5:00 pm. We will have inflatables, face painting, balloon animals, games, prizes and lots of candy! Feel free to let the kids dress up in their costumes, as we'll have a photo booth ready for pictures. See you then! Come and enjoy a fun night with decorated trunks, treats, face painting, crafts, and music. Mark your calendar for free food, candy, games, and a bounce house. Come dressed in a costume and join the fun! A fast-paced Halloween themed variety show featuring the Illinois Children's Choir, the Conservatory of Central Illinois, the Orpheum Science Museum, and local organists playing holiday favorites on the Emmanuel organ. Costumes are encouraged! Safe fun for the whole family! Trunks with treats from 5-6pm followed by a soup supper in Centennial Hall from 6-7pm. Join us for trunk or treating, a community meal, pumpkin bowling, BINGO and more! Want another chance to wear your halloween costume? Join Urbana High School for a night of fun and safe trick-or-treating. There will be games, crafts, dancing, free candy, food for purchase, and more. This event is geared towards children 10 and under and is free to attend. Take a drive past the Crowley Pumpkin Glow and enjoy seeing hundreds of carved pumpkins lighting up in the night. You must Pre-register by October 22 for this fun indoor Savoy event. Kick off your Halloween festivities with some treats at the International and Area Studies Library (IASL) most spooktacular event of the season! Grab some free candy and then sit back and learn about manga horror master Junji Ito with a special guest lecture by Billy Tringali, a graduate student in library and information science with expertise in horror and the gothic, vampire studies, and anime/manga. Then browse our special display of horror comics from around the world. Finally, come in costume and enter our costume contest to win your own copy of Junji Ito’s most recent horror compilation Shiver. It's Trick AND Treat time for you and your dog! Show us a trick you have taught your dog and take home a Halloween treat. Costumes are optional. This event is free to dog park members, but visitors must pay the daily rate ($5) to enter. Trick-or-Treat at the Outlets at Tuscola. Look for the sign on the front doors of participating stores on October 31st from 5-7 pm, while supplies last. Stop by the church for some treats on Halloween. We will have a line of cars with decorated trunks filled with candy! The trunk or treat will run during the Village of Homer's Trick or Treating hours. Attendees can come dressed up, enjoy the different decorated vehicles and collect lots of candy! There will also be food and hot drinks available. DJ Fireproof will also be at the event! Have we missed any events? Let us know – submit your event HERE (preferred) or email us, and check back often to see what we’ve added.